Blu Ray Copy is an easy, one-click, software for anyone to copy and backup Blu ray DVD movies, using a Windows PC. you to copy Blu-ray movies from a single disc to a file folder, disc to ISO image, or direct, disc to disc replication! Fast and easy, one-click operation! 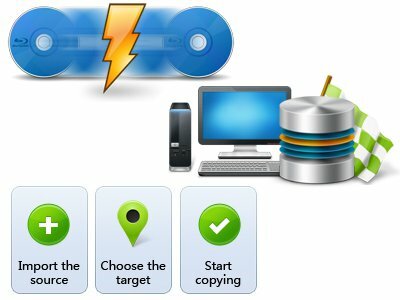 With its fast duplication speed, this handy backup software can save your valuable time and effort, so that you can store your Blu-ray DVD in a safe place and enjoy Blu-ray movies or content on your computer or player. Blu Ray copy is designed for ease of use! for the novice user too! - A few quick settings and one click is really all it takes to get going. Click the link below to try it yourself and see just how easy it is. Copy Blu-ray to DVD discs or hard disks in different formats: DVD-5/9, Blu-ray or DVD file folder, ISO image. Burn ISO file to Blu-ray or DVD disc without quality loss. Copy & decrypt Blu-ray discs from 3D Blu-ray disc to 3D Blu-ray folder, ISO file and a blank Blu-ray disc with ease. Keep original, eye-feasting 3D effect. Three copy modes provided: Full Movie, Main Movie and Custom Mode (Select the chapters, subtitle and audio track you want to copy). Choose any mode at will. Freely set disc label of output files to meet individual requirements. Display output file space needed in Disc size bar for smooth and successful Blu-ray copying. Create a compressed ISO image of the Blu-ray disc, which is perfect for backup on PC hard disk. 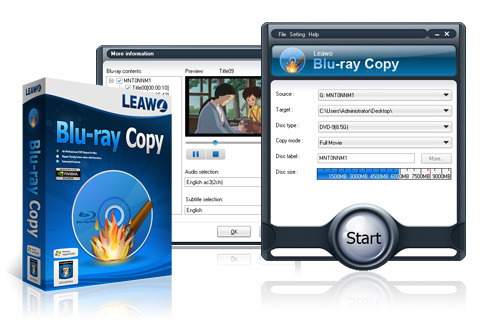 Leawo Blu-ray Copy is one of the fastest Blu-ray disc copy tools to copy Blu-ray DVD with stable process. This saves time, space and energy. Import the source, choose the target and start copying. No technical worries.